For breakfast on Sunday morning, I decided to try my hand at something I'd never made before: quiche. 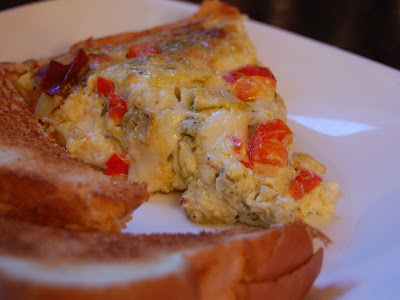 Quiche is another one of those dishes that just intimidates me, for some reason; plus, it requires the kind of time commitment that I don't usually have. Well, I guess I should say that it used to intimidate me; now that I've made one, with pretty successful results, I know I'll be more confident making this in the future. Joe was skeptical when I told him what we were having for breakfast. "I've never liked quiche…" he told me, but after trying this one he informed me that he was officially a real man who was proud to eat quiche, and that I could make this as often as I wanted. Even more surprising than Joe's reaction was Andrew's: My little man absolutely loved this, and ate nearly a whole slice all by himself. The prosciutto and artichokes are my own additions to the recipe, and I really liked the added flavor they gave to the filling. This was a cheesy, hearty, filling and fulfilling breakfast, and I'm pretty sure Joe is going to be asking me to make it again very soon! 1. Heat oven to 425 degrees. Make pie crust as directed on box using 9-inch glass pie plate. Bake 7 minutes. 2. Remove crust from oven; sprinkle 1 cup of the provolone cheese over the bottom of the crust. 3. In a small bowl, mix pesto and parmesan cheese until smooth. Carefully spread over provolone cheese. Top with prosciutto, artichokes, bell pepper, and the remaining provolone cheese. 4. In large bowl with wire whisk, beat eggs, milk, hot sauce and salt and pepper until well blended. Pour over cheese. 5. Bake 7 minutes. Reduce oven temperature to 325 degrees; bake 15 minutes. Cover edges of crust with foil. Bake 23 to 28 minutes longer or until set and knife inserted in center comes out clean. Let stand for 5 mintues before serving.